Adequate knowledge about what to do and what not to do during the pre Achilles tendon rupture surgery phase is important as once all the preliminary tests are done and the results indicate that a surgical method is required to treat your Achilles tendon rupture, it is important to take as much rest as possible and manage your stress levels before the surgery. Since it is a surgical procedure, it is important to maintain your physical and mental health so that you can carry out the planned procedure without any hiccups. Before Achilles tendon rupture surgery, you should ensure that you cut down on your overall physical activity significantly. As walking is to be restricted as much as possible most doctors will definitely prescribe a cast and crutches. The other option is to go in for a CAM walker. 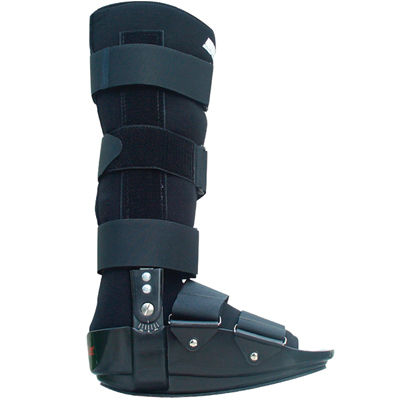 This is essentially a boot that can be adjusted through metal rods that are placed at the sides of the boots. Additionally, it also has Velcro straps that help keep the foot and the ankle immobilized. The tight fit of the CAM walker ensures that there is no strain or pressure being applied on the injured tendon and the adjoining muscles. There will absolutely no problem in walking while wearing these. As a cast is imperative even after the surgery, the CAM walker can also be used after the surgery for a couple of weeks till the tendon gets healed. Some people can find the CAM walker to be heavy in the beginning, but with the adjustable Velcro straps, it will only be a matter of days before they get used to it. Also, as the stitches will still be fresh after the surgery, it is a much better option in comparison to a cast. CAM walkers also come with adjustable angle settings. Some doctors feel that there is a chance of the tendon healing faster and better if these angle settings are used. The doctors start by placing the patient’s foot in a slightly downward angle and then gradually shift it to 90 degrees as time passes and healing improves. Whether the patient decides to go with a CAM walker or a cast, the chances of him being up and about are considerably reduced. This is a good thing as the stress on the foot is reduced. If you’re thinking of opting for a CAM walker, it is better to get a leave of absence from the school or office or if possible, work from home. It is difficult to drive with a CAM walker and a foot accelerator will cost an additional $300-$500, so spending time at home is the best option that you should consider. Your time can be used to do routine household work that doesn’t involve too much stress or heavy lifting. Another useful way to spend this time is by going over with your insurance policies and seeing that all the paper work is in order for the Achilles tendonitis treatment. In case of any doubts or questions regarding the surgery, the surgical team can be sought out. Most patients tend to relax and spend as much time with their family during the pre Achilles tendon rupture surgery phase. Few patients even work from home if it’s possible. As it can be a very anxious time, it is better if you talk to a friend or a loved one regarding any problems you might have. During the pre Achilles tendon surgery phase, you can also talk to your doctor and learn all about the procedure. This entry was posted in Achilles Tendon Rupture and tagged achilles tendon cam walker, before achilles tendon surgery, before rupture surgery, pre achilles surgery, pre achilles tendon, pre achilles tendon rupture by Zipheal Editorial Staff. Bookmark the permalink.